Haven-Galle, the ultimate tropical getaway! Haven-Galle is a four bedroomed self catering villa set in a residential area for guests to enjoy some peace and tranquility away from the daily chores and stresses of life. The villa is well equipped to cater to your needs and requirements, be it, to cater a family or a group of friends. All bed rooms are equipped with air conditioners and ceilings fans and offers en suite bathrooms. Hot water is provided via solar power to all bathrooms with quality towels. All rooms are equipped with Cable T.V, lockers and a mini fridge. The villa is spacious and satiates to your comfort and needs. There are two living rooms in the villa, a dining hall, and two fully equipped kitchens. The kitchen provides its guests with a microwave oven, cooker, refrigerator, cooking utensils and crockery. A washing machine is available for your personal laundry. Free parking is available on site. Daily housekeeping and cleaning is provided at the villa upon request. A caretaker of the place is available for any assistance. The property is set in a tropical garden surrounded by lush greenery. 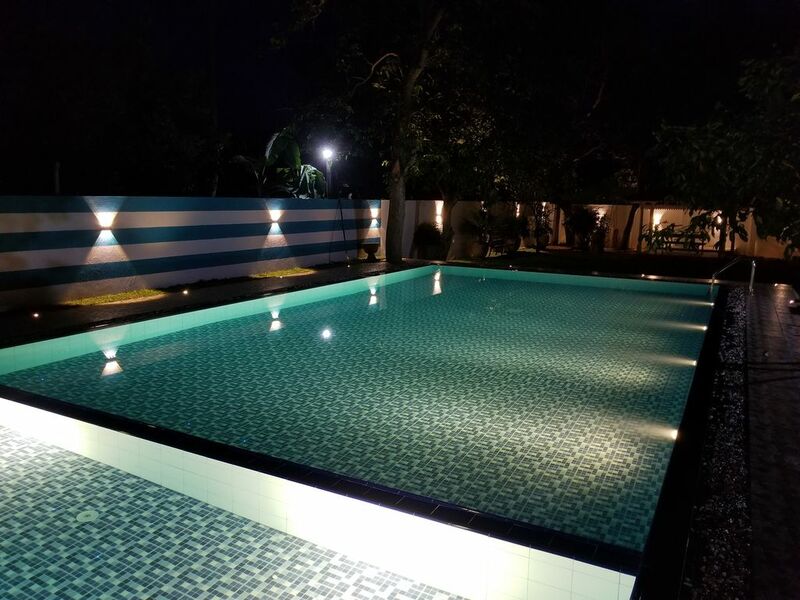 The garden facilitates outdoor dining and a swimming pool of length 20ft by 10ft with a depth of 3ft to 5ft with an adjoining kiddies pool of 2 ft. The villa is set at a comfortable distance from the main attractions in Galle. It is located within 1.6 km of the Galle International Cricket Stadium and 1.9 km of Galle Fort. Dutch Church Galle is 1.9 km from the villa, while Galle Light house is 2.3 km from the property. All main attractions are within minutes drive away! Day trips can be arranged to the renowned Unawatuna beach which is only 15 minutes away from the villa. There are plenty of restaurants to choose from close to the villa where you could choose to enjoy the exquisite local cuisine or even other cuisines of your liking.